Weekend Herb Blogging has been suspended for this week as a tribute to Sher of What Did You Eat?, who passed away on Sunday (see here for more information). Kalyn suggests that people who wish to honor Sher's memory do so by posting one of her recipes or a post sharing memories of her on Sunday, July 27 (in lieu of this week's round-up). Please send me your links to WHB posts between now and August 2. I will post the round up on August 3. 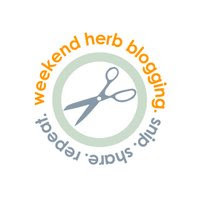 I have the pleasure of hosting the Weekend Herb Blogging event next week (July 28-August 3). Never heard of Weekend Herb Blogging? It's a event created by Kalyn of Kalyn's Kitchen in which "bloggers around the world photograph and write about herbs, plants, veggies, or flowers, and on the weekend, we publish a Recap with links to all the posts." Entries should be "limited to recipes or informative posts where people can learn about cooking with herbs or unusual plant ingredients." 1. Entries submitted for Weekend Herb Blogging need to be posts written during that week specifically for Weekend Herb Blogging and that post cannot be entered in any other food blog event. (The only exception to this rule would be instances where a photo used in a WHB post is submitted to a photo event.) To keep the event manageable, each participant is limited to one entry per week, and entries cannot contain more than one recipe. 2. Weekend Herb Blogging entries should have the goal of helping people learn about cooking with herbs or unusual plant ingredients. With this in mind, only two types of entries will be accepted: a) Recipe posts where an herb or unusual plant ingredient is one of the primary ingredients in the recipe, or b) Informative posts that spotlight one herb or unusual plant ingredient, particularly including information about how it is used in cooking. 3. Entries must contain the words "Weekend Herb Blogging" with a link to the host for that week (that's me! So, please link to my blog Sounding My Barbaric Gulp!) as well as a link to Kalyn's Kitchen. a photo attached to the e-mail. For more information about WHB, check out Kalyn's FAQ page & Weekly Recap Archives. SO...if you'd like to participate in the WHB event next week, you should post a recipe on your blog sometime between now and August 2, then email the above info to me (kelly AT barbaricgulp DOT com) before August 2. I'll be posting a round-up here on the evening of the 3rd.